Work on my first mass continues. 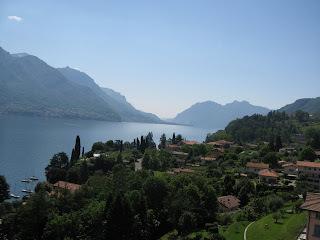 I wrote the latest movements while hanging out with my family in Bellagio (Italy, not Vegas). I was inspired not so much by the view but rather by a barking dog. It seems the world, regardless of where you are, will never quite be silent. Interestingly, the dog barked a minor third but then, every few iterations, it would reach a quarter-tone or so higher suggesting major third. He remained in d-minor (except for the D-major interludes) throughout the vacation, a convenient fact given the structure of the mass (as laid out in the Kyrie) moves from C# phrygian to D and then to E-Major -- so this movement more or less moves to D-minor. I've combined the 2nd & 3rd movements of the Credo with the Sanctus. With the Benedictus already complete, I'm moving on to the first movement of the Agnus Dei.